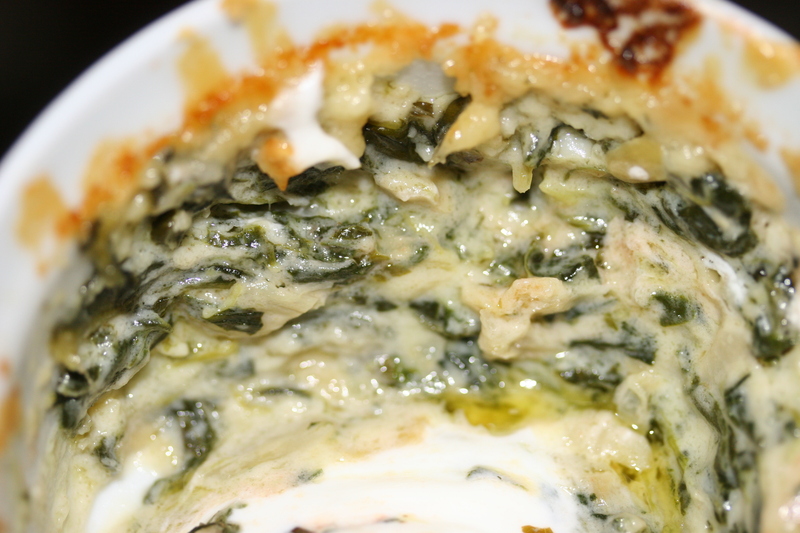 Given that I attempted to replicate Houston’s Club Sandwich, I thought I might go ahead and try their Spinach Artichoke dip too. 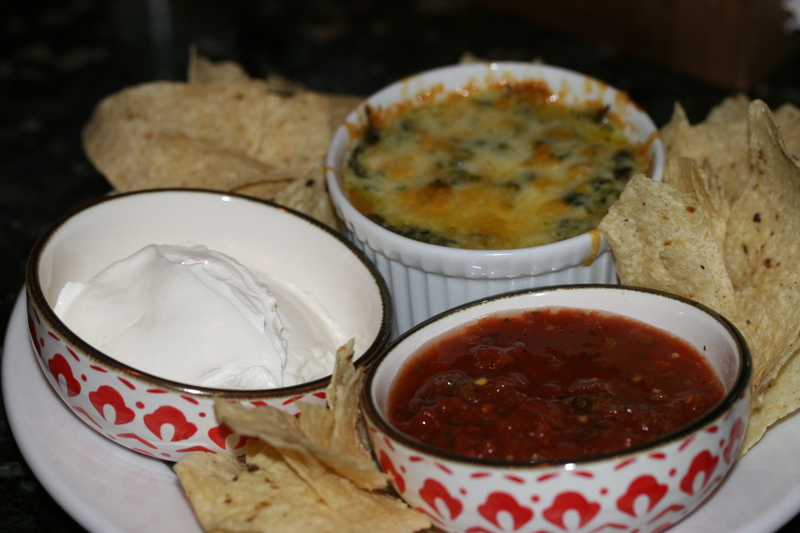 They serve their dip with sides of sour cream and salsa along with a warm bowl of tortilla chips. When sharing with friends there is a always a little chip / dip panic to make sure you get your fair share. When it’s just the two of us, I can relax a little. To avoid all of that scarcity panic, I made two smaller bowls so each of us had our own bowl with ample chips. The only thing I can think of that Houston’s does differently than any other S&A dip is the tortilla chips and the salsa. 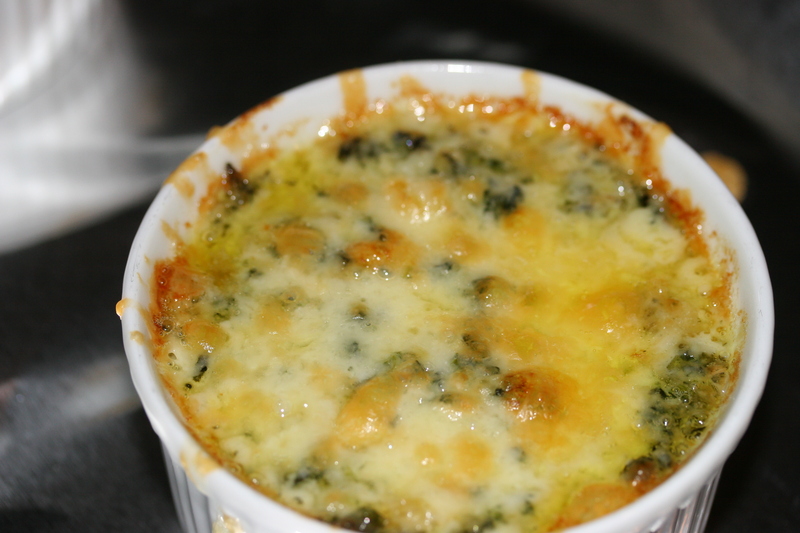 It’s such a tasty dip that is creamy and savory. The salsa adds a punch of acid and heat that works great together. 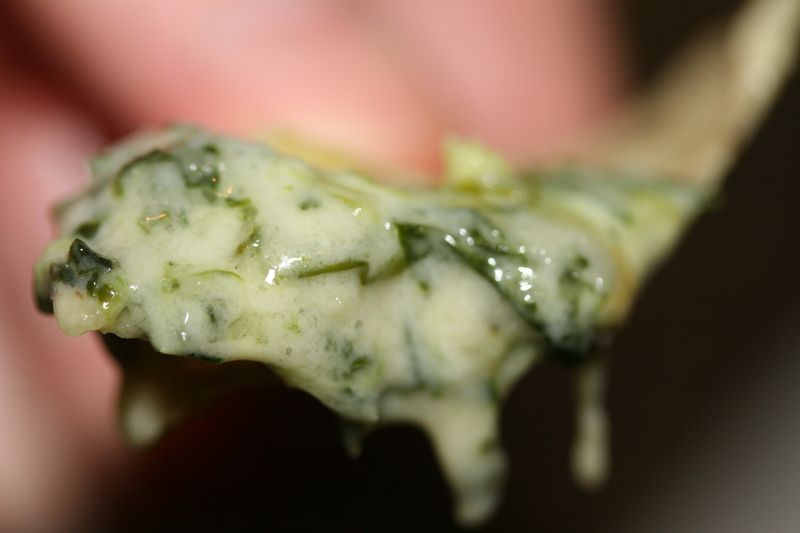 Lastly, The fact that you have spinach and artichokes in the title, also helps make you feel a little less guilty. 1. Start by making a simple roux. Melt your butter in a sauce pan on medium-low heat. Add your onion and garlic and cook until softened (5 minutes). Whisk in the flour and stir for about 1-2 minutes. 2. If your cream isn’t room temperature microwave it for 20 seconds until it’s tepid or even warm. Whisk it into the roux and stir until thickens and is boiling or simmering. Now stir in the lemon juice, chicken broth, Tabasco and Parmesan cheese until melted. Remove from heat and set it aside to cool for a few minutes. 3. Stir in the sour cream followed by folding in the artichokes and spinach. Taste it and salt and pepper accordingly. If you like it hotter amp up your Tabasco. 4. 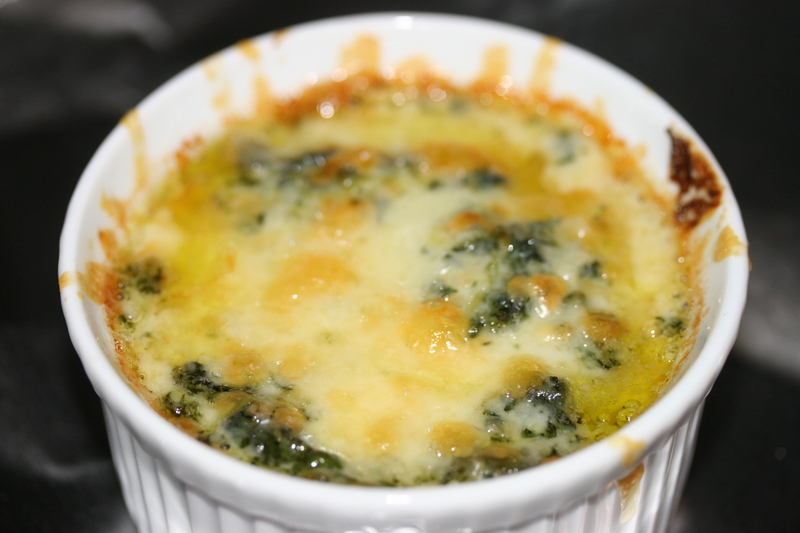 Pour into a oven safe ramekin and top it with the fresh grated white cheddar cheese. Put it in the middle rack of your oven on broil until the cheddar starts to brown. 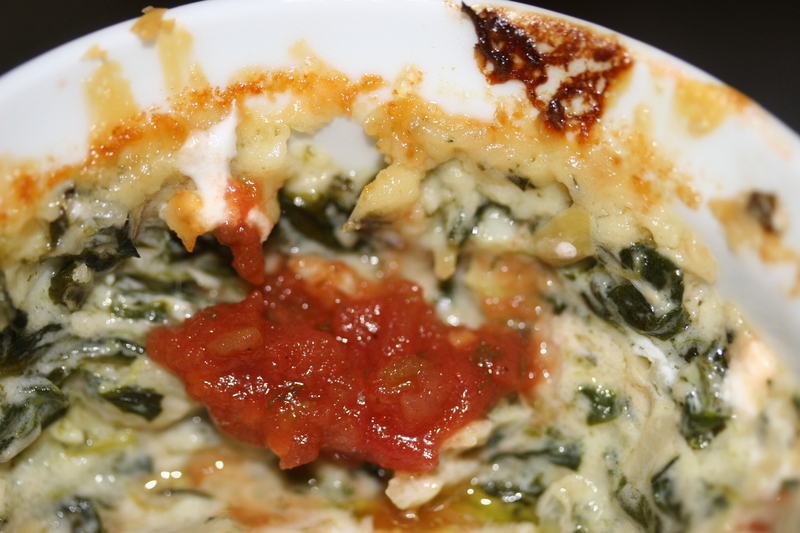 Be careful with your ramekin because it will be hot. Serve along side bowls of sour cream and your favorite salsa. Use a sturdy tortilla chip for dipping. Thanks for the note. Sorry for the delay but yes sour cream. I will update the recipe to specify. Thanks for pointing it out and hope you liked it. Iam also confused? Do you simmer the sour cream or add later? Also is any of that 2 cups of sour cream supposed to be part of the salsa and sour cream end? After you make your roux turn down the heat to low or simply take it off the heat and stir in your room temperature cream and then once that is thickened you then stir in the artichokes, spinach and sour cream. You want to do this off the burner but the pot should be still warm. Hope that helps. Help..cream?? Heavy cream or cream cheese or sour cream??? Sorry Karen. Heavy cream added to your rue/roux. That said I think adding a little of both cream cheese and sour cream actually sounds like it take it to a new level. I am actually going to do that the next time I make this.